The 1625-E unit has increased flow generating a higher level of cavitation, for faster and more efficient cleaning. While operating at lower pressures it's designed specifically not to damage paints or coatings yet strong enough to clean to bare metal if needed. 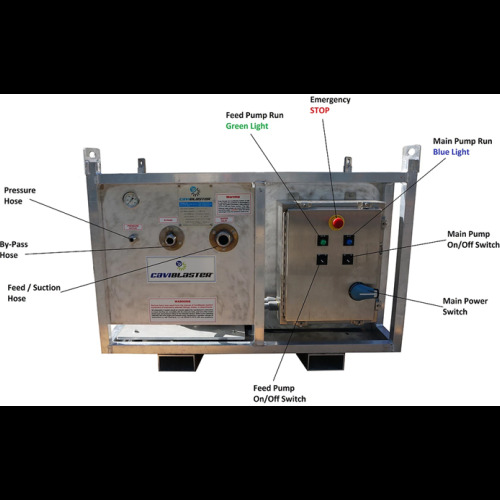 This unit comes equipped with an industrial, multi-voltage, 3 phase electric motor with a 1 year manufacturer's warranty and an industrial grade Udor triplex plunger pump boasting a 5 year manufacturer's warrranty. The compact and lightweight industrial grade aluminum frame comes with lifting eyes and forklift slots. Gentle for smaller applications while boasting enough power for larger industrial applications. Standard accessories include zero-thrust balanced gun, electric centrifical self priming pump, 15' of by-pass hose, 50' of 1/2" nuetrally bouyant high pressure thermoplastic hose. Unit can also be utilized as an unbalanced 2 gun system. All electric units come in a 50hz or 60hz option.